Offer your "store-front" merchants another payment solution to decrease their costs, increase their revenues and reduce their payment headaches. On-line check payments can increase business and provide customers another payment option for all your web-based and E-commerce customers. We can help you offer banks the convenience of a bill pay service, or you can enhance your existing service with a powerful, reliable, cost-effective solution. Go after the healthcare industry and make their collection more efficient, accurate and convenient while providing patients with a way to pay their bill electronically. 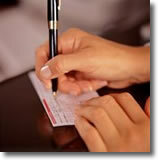 Offer utility companies a simpler way to collect payments and deliver convenience to their customers at the same time. Offer the insurance industry services for their customers which will help them reduce their overall costs and labor. . . . . . . .AND almost any other industry - ACH Payment Solutions can optimize your payment collections and payment services options!